Panda Internet Security 2011 is the security suite that protects you against viruses, hackers, online fraud, identity theft and all other known and unknown threats. It lets you use the Internet for everything, like buying or banking online, with complete peace of mind and without interruptions. Also, it keeps your inbox spam-free, and allows you to surf the Web privately and securely with the new Panda Safe Browser. Thanks to Collective Intelligence, the product is safer and faster. Collective Intelligence is an information network that leverages the knowledge gathered from the Panda user community. 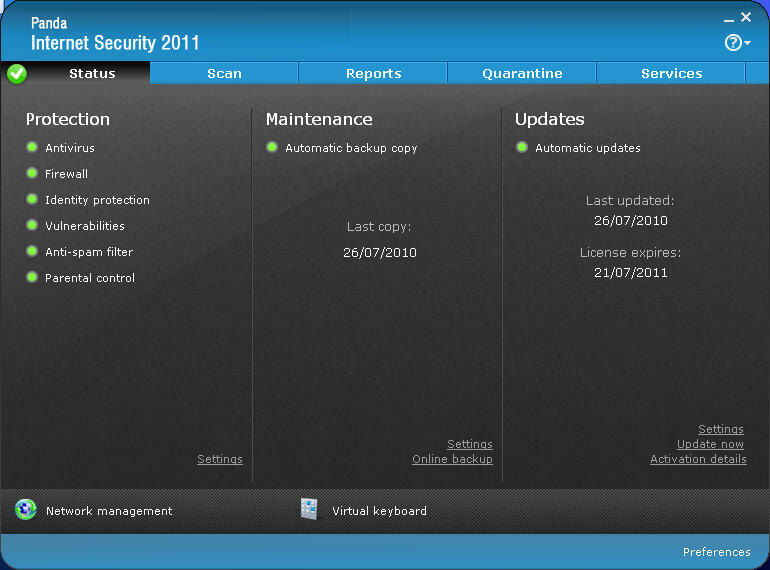 Panda Internet Security 2011 protects and detects in real time. Panda Internet Security 2011 new version includes a host of utilities and new features for your peace of mind and total satisfaction. Its improved protection against spyware, phishing, rootkits and banking Trojans lets you surf the Web with complete peace of mind, thanks to the new Web Filter and intelligent updates. You will also enjoy local and online backup as well as the possibility to access your PC remotely. Panda Internet Security 2011's new, elegant, intuitive, easy-to-use interface offers maximum protection with minimum impact on the PC. Qweas is providing links to Panda Internet Security 2011 16.00.00 as a courtesy, and makes no representations regarding Panda Internet Security 2011 or any other applications or any information related thereto. Any questions, complaints or claims regarding this application Panda Internet Security 2011 16.00.00 must be directed to the appropriate software vendor. You may click the publisher link of Panda Internet Security 2011 on the top of this page to get more details about the vendor.